The 34th session of the UN Human Rights Council will take place from 27 February to 24 March 2017. 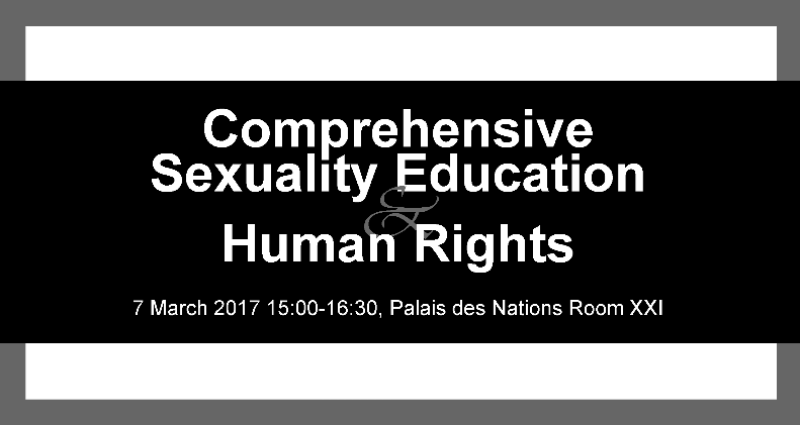 Find below information about anticipated sexual rights-related resolutions, panels and reports, UPR outcomes and parallel events taking place during the 34th session. Outcomes from the 26th session of the Universal Periodic Review (UPR) will be adopted during this session of the HRC. 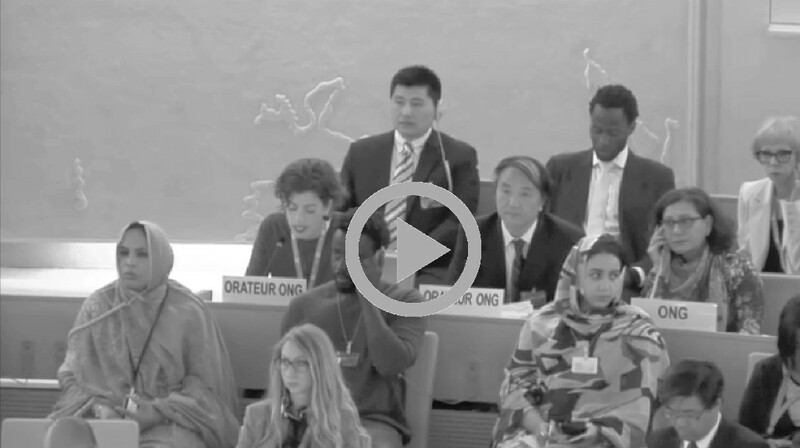 The 26th session of the UPR was held from the 31 October to 11 November 2016. HRC33 Statement: Stop Using Women’s Bodies as the Battlefield! Thank you Mr. President, Action Canada makes this statement on behalf of the Sexual Rights Initiative. We commend the Special Procedures and the Office of the High Commissioner for their courageous work to advance gender equality through their reports, country visits and public statements. Their rigorous investigation of human rights standards as applied to gender equality has shed light on the pervasive and shocking multitude of rights violations women and girls experience throughout their lives in all parts of the world. We note with appreciation the initiative of some States to advance the normative and international legal framework on gender equality. However, we deeply regret the consistent parsing, fragmentation and erosion of women’s human rights which has prevented the Council from substantively taking up most of the findings and recommendations of the different mechanisms in a way that is meaningful for women and girls. While States heatedly debate the semantics of women’s rights to control their own bodies and their own lives, according to UN agency statistics, each year, 303 000 women die from preventable maternal mortality, 20 million women are forced to seek out unsafe abortions, 225 million women are unable to access safe and modern methods of contraception, 1.2 BILLION women experience physical and/or sexual violence, and every single woman, in every part of the world, faces entrenched structural and systemic barriers to the realization of their human rights, their dignity and their autonomy. We therefore ask States that seek to deny women their rights, for whom do you speak, when you speak about gender equality? Because it certainly isn’t for the women and girls of the world, it isn’t for us. We call on this Council to stop using women’s bodies as the battlefield in which geopolitical and ideological debates are fought and to work together to advance women’s human rights as is your duty and obligation. This statement is delivered on behalf of the Center for Reproductive Rights, the Sexual Rights Initiative, and the International Initiative on Maternal Mortality and Human Rights. 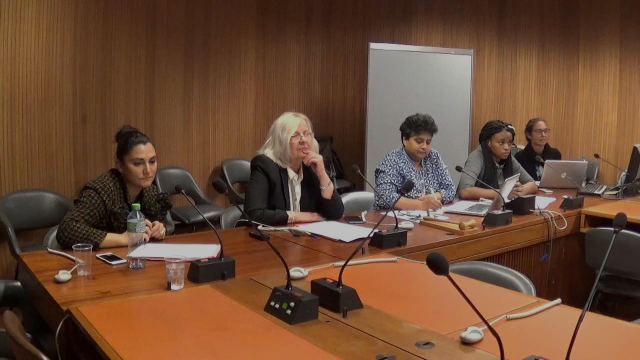 We welcome the follow up report by the OHCHR on the technical guidance on the application of a human rights-based approach to the implementations of policies and programmes to reduce preventable maternal mortality and morbidity. Despite massive reductions in maternal mortality rates over the last two decades and increased implementation of the technical guidance, the full realisation and enjoyment of women and girls’ sexual and reproductive health rights remains a distant goal for millions. In 2015 alone, there have been 303,000 pregnancy related deaths of women and girls, which were largely preventable, with millions more women and girls suffering serious and sometimes lifelong injuries. Particularly affected by these higher rates of maternal mortality and morbidity are adolescents, women and girls in conflict and humanitarian situations, women and girls with disabilities and other marginalized women and girls. We therefore call on this Council to reaffirm the centrality of human rights to preventing maternal mortality and morbidity and reinforce linkages between international and regional processes, including the 2030 Agenda and the Global Strategy for women’s, children’s and adolescents’ health.